I realized today that my first 6 months of the year have been quite productive. I have had 3 publications coming out and this is more than pleasing. In January, dancing girl press has released my second US chapbook, Diagnosis. In March it was the New Anthology of American Poetry's turn, the book that I have edited and translated, has been published by Ensemble. 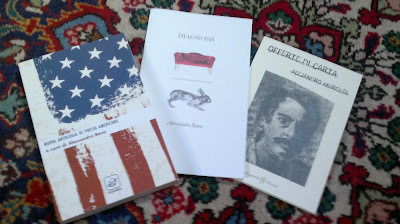 In May, Offerte di Carta, my translation of the first Italian collection by SF Poet Laureate Alejandro Murguía was published by Gilgamesh. I have had 12 poems as well as 2 poems by Antonia Pozzi in English translation accepted by journals I am back to writing poetry lately and I am polishing the biography. I haven't submitted a lot, given my standards. 41 submissions will have to do. I know I must write more to send out more, but I am not worried. Poetry simply happens!